Follow on Facebook and Instagram for up-to-date schedule, and process photos. Much of my found material comes from estate sales, where I often make acquaintances with the deceased who can only speak to me through the keepsakes in junk drawers and cellars. Estate sales can be a spiritual place, as well as a treasure trove of everyday relics, and often time capsules of a bygone era. I started seeing the sacred in the discarded, and felt compelled to find an after-life for what might seem completely worn-out. I draw my inspiration from the patinas that build up on everyday utensils, the wear and erosion that affect tools, and the way an object is marked by the ages. I’m always on the hunt for interesting artifacts to use, ones that are interesting but too far gone for utility, or too damaged to be collectible. My collecting feeds my artwork, and my artwork fuels my collecting. 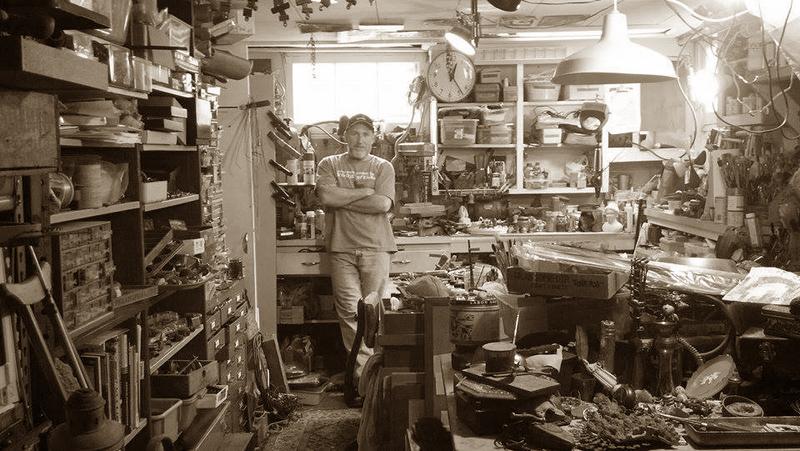 My process begins by filling shelves and drawers with worn found objects, organizing them by use or shape. 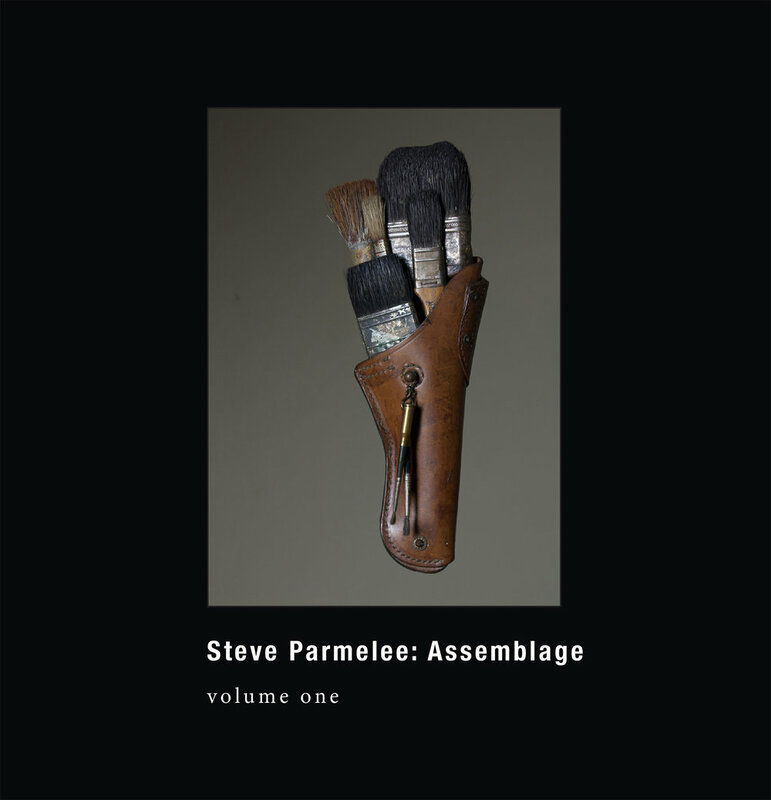 I will then intuitively gather small piles together onto a table into potential assemblages. About half of the time, I invite interesting objects to my work bench, bringing various compatible items onto the pile, guided by a developing story or emotion, trusting the finished piece will convey a meaningful narrative. The other half of the time, I begin with a concept sketched in my notebook, and then become hunter & gatherer for the fitting ingredients. I’ve had equal success with both approaches. Common challenges include: holding objects to a common theme, keeping a unified color palate, and maintaining the sense of scale & balance while creating dynamic visual interest. I choose to drill and fasten with vintage hardware as much as possible, with minimal glue or welding, allowing me to disassemble and make revisions or additions. My tarnished old screws, nuts & bolts are often visible - proudly revealing the engineering behind the pieces. I strive to maintain the as-found faded patinas, resulting in a subdued color palette, evoking the aged warmth of a sepia-toned photograph. I feel a generational connection with these objects handled by unknown past lives. I try to relate a concept or emotion in my work, playing off of the the frailty, or durability, of the found objects, and the undercurrents that they bring. A tactile wisdom radiates from worn patinas. The inclusions can strike an individual, or even collective, memory. I believe there is an often overlooked beauty in the ordinary, and a worth in the discarded. While we may feel evolved beyond our ancestors everyday dilemmas, a weathered, seemingly century-old piece of contemporary artwork may be a reassuring reminder of the timelessness of the human condition.